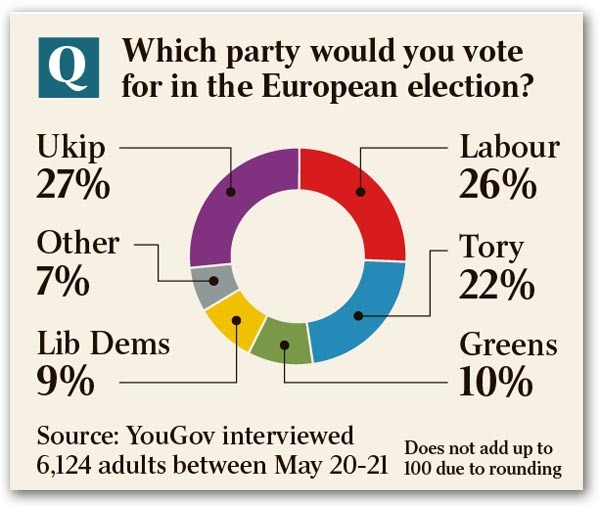 A YouGov poll on voting intentions for the euro-elections, published in today's Times, puts UKIP on 27 percent, one point ahead of Labour on 26 percent. The Conservatives are put third with 22 percent of the vote and the Lib-Dems drop into fifth place at nine percent, behind the Green Party with ten percent. On the other hand, an Opinium poll for the Daily Mail puts UKIP on 32 percent, against Labour's 25 percent, with the Conservatives on 21 percent. The Lib-Dems were said to be battling the Greens for fourth place, each on 6 percent. A few days previously, though, with fieldwork completed on 19 May, another YouGov poll puts Labour first on 28 percent (up from 27), UKIP second on 24 percent (down from 26), the Conservatives on 21 (down from 23), the Lib-Dems on 10 (up from 9). The Greens had come up with 12 percent, an increase on three points. The BNP was scarcely registering with one percent. At the same time, the Mirror announced its own poll, putting UKIP on 32 percent, with Labour on 27 percent, the Conservatives on 23 percent and the Lib-Dems on 9 percent. Thus, what is of interest in an election that is cast as possibly attracting only 27 percent of the electorate, is the jockeying for first place between Labour and UKIP, with the narrowness of the margins and the obvious volatility making it impossible to predict the outcome with any confidence. With that in mind, though, it is as well to remind ourselves of what these euro-elections are all about – an exercise which is as close to the concept of "democracy" as the EU ever comes – which is not very. Certainly, there is nothing "democratic" about Mr Cameron's "top table", the Council of Ministers. There, when a vote is called, qualified majority voting (QMV) applies. Britain has 29 votes out of 352, representing eight percent of the vote. A qualified majority is 252 votes (73.9 percent), leaving Britain with a structural deficit of 223 votes. However, in the European Parliament, the situation is little better. There are 73 UK MEPs, and these represent a mere 9.7 percent of the 751 elected MEPs (post-2014 election). Given the party splits, this level of representation is notional. UK MEPs rarely vote together as a single bloc. Even if they did, they could never muster the 376 votes needed for a majority. Furthermore, the powers of the Parliament and the Council are limited in important but poorly recognised ways. As an increasing number of laws come into being via international standards, these are most often implemented by the EU as delegated legislation (Commission Regulations) using the comitology procedure. Every year, more than 2,500 measures are processed via this route, passing through one or more of the 200-300 committees set up for the purpose. That is approximately 30 times more measures than are processed via the mainstream ordinary legislative procedure. The committees themselves are populated by anonymous officials from the member states, but they have no powers to amend or reject Commission proposals. They can either approve them, or refer them to the Council if they disagree with them. At Council, though, 70-90 percent of decisions are made by officials in the 160-plus preparatory bodies. These are known as "A-points" – colloquially the "A-list" – which are adopted by Ministers without discussion or a vote. With Regulations made under acts passed before the Lisbon Treaty, the Council or Parliament can veto measures on certain grounds. That changes, though, with Regulations made under legislation approved post-Lisbon. The veto no longer applies. Here, we now have a situation where the Commission only has to "review" proposed regulations if there are objections. There is no obligation for it to change them. After carrying out the review, the Commission can then go ahead and implement them. Then, via the REFIT programme, the Commission is updating pre-Lisbon legislation, with the aim of eliminating the veto altogether. Britain (and Member States generally), with already limited power, are thereby weakened even more. And this is, supposedly what we're voting for today … the day the people are supposed to get their say in the running of "Europe". Like talking to the BBC, playing their game only makes us their stooges. In reality, splitting up 9.7 percent of the vote between a group of dysfunctional political parties, to let them play in an institution that hasn't any real power anyway, is something for which it isn't even worth getting out of bed.